Most travelers associate Southern California with sun, sand and surf. But while beaches certainly play a significant role in the region's allure, to think that's all it has to offer does it a disservice. Sneak just a bit inland, between laid-back San Diego and the trendy O.C., and you'll discover a great little secret: Rancho Bernardo Inn, set in 265 acres of undulating, tree-dappled hills. The residential setting is bucolic, and you don't even have to sacrifice sunshine. In fact, you'll enjoy better weather here, since you don't get the fog rolling in off the ocean. Rancho Bernardo Inn is a true destination resort. It attracts golfers with two sets of fairways, tennis players with a full tennis center, massage lovers with a comprehensive spa and families by catering to kids with the seasonal Camp RBI. And despite the leisurely atmosphere, or perhaps because of it, this place attracts groups aplenty during the week. There is over 15,000 square-feet of meeting space, all of which is adjacent to outdoor patios or courtyards. Full conference service planning is available, as is an in-house A.V. department, business service center and even floral services. The Inn is also popular with locals seeking a quiet weekend away (nearby Escondido is home to the California Center for the Arts, loads of antique shops and even a few wineries), or just an evening out on the town. Competing for guests' attention in the recreation arena are the golf courses and tennis center. The 18-hole championship West Course layout dates back to 1962. Recent upgrades have added new challenges, and this is the only course in San Diego to have hosted both PGA and LPGA events. It is complemented by the 27-hole executive Oaks North course. When you're not practicing your drive (each course has its own driving range), you can work on your serve at the twelve-court tennis facility, which includes two stadium courts. John McEnroe and Jimmy Connors have played here, and guests can follow in their footsteps — there are five pros on-site, and private lessons are available. Style-wise, the resort takes its cues from the surrounding landscape and local history. 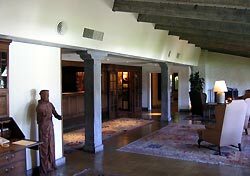 With its private home feel, the lobby lounge reflects classic ranch style: rustic and quietly stylish at the same time. A nod to the region's Spanish influences can be found in the details. Black wrought-iron wall sconces adorn the boardroom. Beamed ceilings, fireplaces and brooding oil portraits add to the warm atmosphere, which extends to the 287 earth-toned guestrooms and suites. Accommodations are tasteful, with custom furnishings, antiques and original artwork. Every room has a patio or private balcony with a view of the valley, golf course or gardens, and suites come with wood-burning fireplaces and adjoining courtyards. From chocolate-raspberry body treatments at the spa to meeting space for up to 500 to kids' activities that offer more than Sony PlayStations — special weekly programs include Destination Science, where kids can make their own robots — all bathed in temperate, year-round sunshine, Rancho Bernardo Inn is more than just a resort for all seasons. It's a resort for all types of travelers ... as long as those travelers appreciate serene, comfy luxury.